A Berumdaful Cruise- Day 1, Dinner inside Rapunzel’s Royal Table | What's Up With The Mouse? 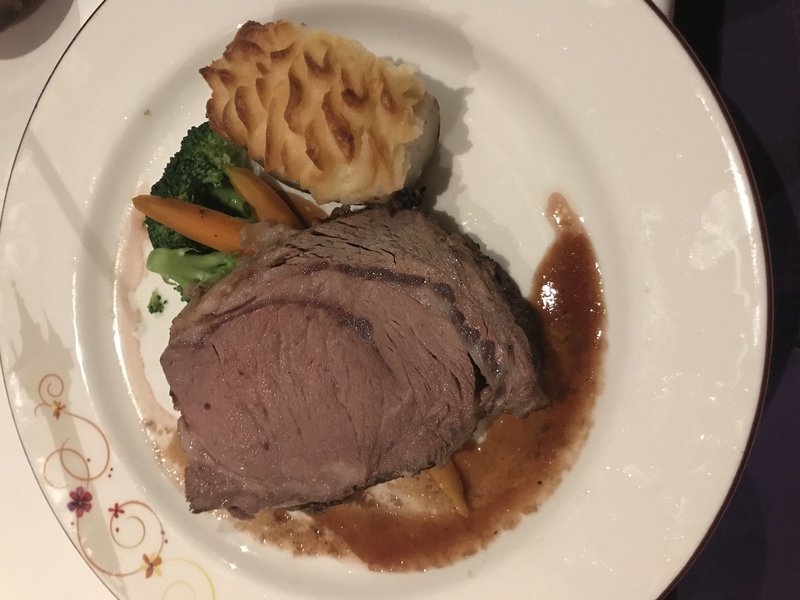 Now, we were a big group- traveling with 4 travel agents and their families our group grew pretty large for dinner, 27 people to be exact! So, the usual first night table juggling had to be worked through and set for the next 4 dinners. 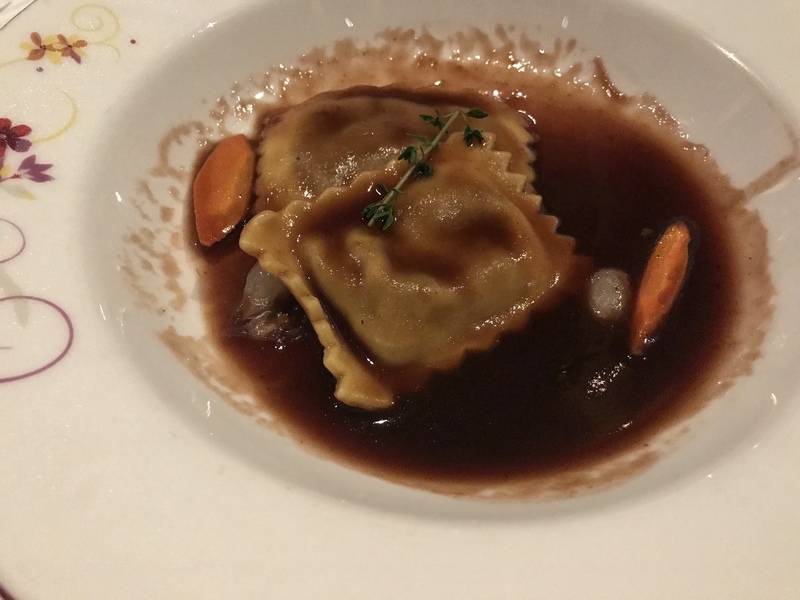 Food wise, to start I ordered the Ravioli “Tiroler” that was filled with Puffed Beef and Portobello Mushrooms tossed in a Red Wine-Thyme Reduction served with Roasted Carrots and Pearl Onions. 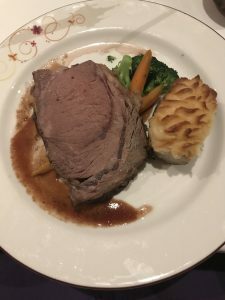 For my entree, I ordered the Captain of the Guards Roasted Prime Rib of Beef with a Double Baked Potato, Broccoli, Sweet Roasted Carrots, and a Red Wine-Veal Sauce. 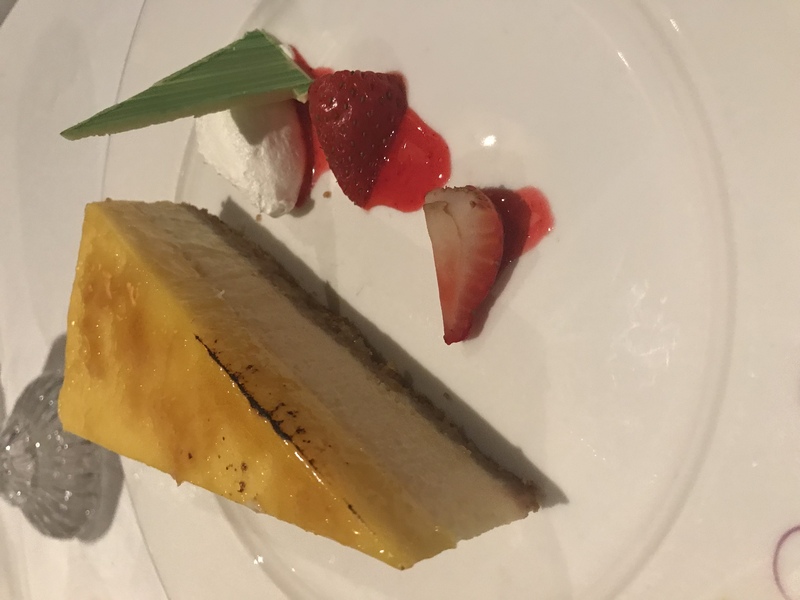 For dessert, I had the Crème Brûlée Cheesecake that has a layer of Baked Cheesecake with Caramelized Crème Brûlée served with Fresh Whipped Cream. Rapunzel’s is a lot- loud with minstrels and thugs roaming around. We were even visited by Flynn Rider and Rapunzel. 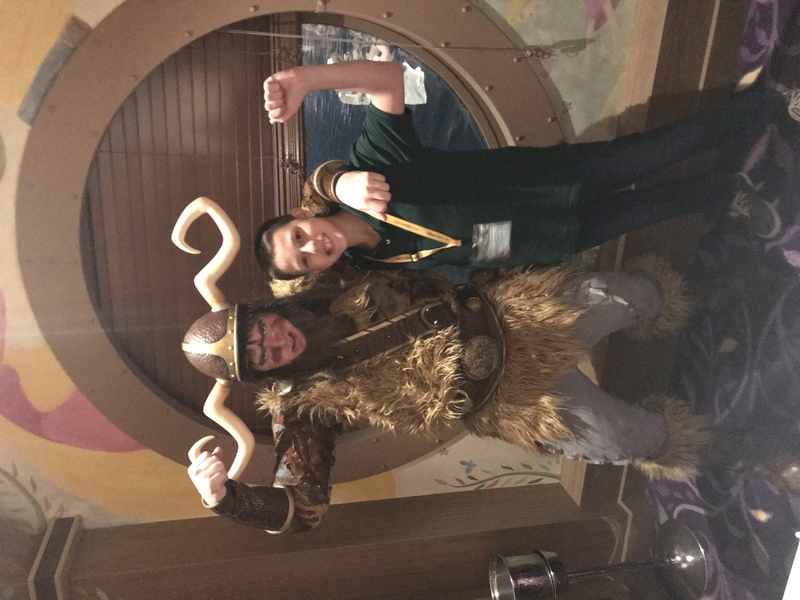 One thug Vladamir, took a liking to our son and renamed him “Rebecca” (a more thug-like name we were told) – which then became Mike’s long running joke throughout the cruise. 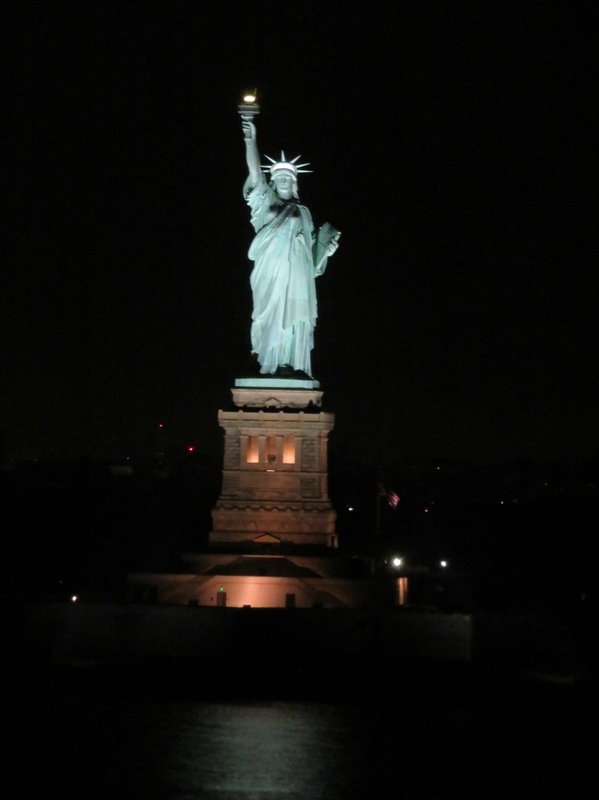 Just after dessert we were able to run upstairs to deck 4 to see the Statue of Liberty as we passed by…. priceless! 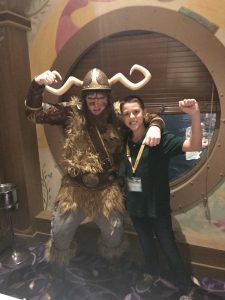 After dinner- Mikey wanted to meet up with Pluto and we needed to do some shopping all before our 8:30pm showtime for Disney’s Tangled in the Walt Disney Theater. Then there was the rest of the night ahead of us too! 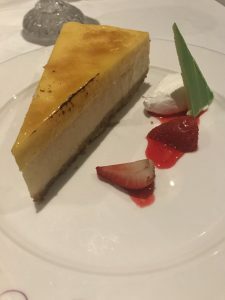 This entry was posted in 2018 Disney Cruise Line, A Berumdaful Cruise, A Family Trip Report, A Trip Report, Dinner Show, Disney Cruise Line, Disney Dining, Disney's Magic. Bookmark the permalink.